XM anomalies are free, large-scale cross-faction events hosted by Niantic Labs in cities all across the world. They are great opportunities to participate in intense competition, meet fellow agents, and score some Ingress swag. Anomaly cluster ornaments as they appear on the intel map. Note that volatile portals may or may not be marked, depending on anomaly rules. An anomaly is a competition between the two factions to complete specific goals, typically held on a Saturday. Anomalies are presented in a series, with different cities participating in each anomaly. 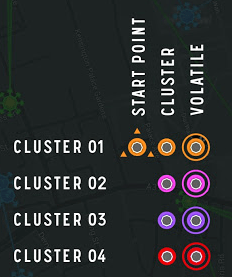 Over the history of Ingress, anomalies have been conducted in a variety of formats, and with various tweaks to the rules. The basic principles you will need to understand for an anomaly will be discussed below; for specifics about the rule set for a particular anomaly, you will need to read the rules documents released by Niantic Labs for that anomaly. Anomaly events are announced on the official Ingress Google+ page and posted on the Ingress Live Events page. In order to receive your anomaly participation medal, you will need to register on the events page and with your faction leadership. An anomaly event usually lasts four hours, divided into several phases. During each phase, a set of portals (referred to as a cluster or anomaly zone) will be active. Only actions involving the portals in the active cluster will be counted toward your faction’s anomaly score. During the event, the cluster portals may be displayed with colored rings around them in the scanner and on the intel map. These rings are referred to as ornaments. On the day of the anomaly event, agents will congregate at a start point, a portal within the first cluster marked with three triangles around it. At specific points during a phase dictated by the rules, a scoring window occurs. The time and duration of the window will be specified in the rules. At a random, pre-determined time during that window (unknown to the agents), a snapshot is taken of the portals in the active cluster. Scoring for that cluster is determined from the state of the portals at the time of the snapshot. creating links or control fields attached to cluster portals. Sometimes, points or some other advantage can earned for other actions, such as finding and decoding dead drops, or winning the last septicycle in various cells. After the last measurement, agents congregate at a predetermined location for the after-party, where the results are announced, prizes are given out, and agents mingle. The results of an anomaly series often have an effect on the Ingress storyline, details of which are sometimes released during the after-party. Your faction will likely put you on a team that will work together during the anomaly. Make sure you get in touch with your team leader; he or she will have further instructions for you on preparing for the anomaly. Operations security (OPSEC) is taken seriously for anomalies, so be aware that you will likely only be told what you need to know for your specific part in your faction’s overall plan. In general, you’ll want to show up with your inventory maxed out. Anomaly events will often have you using items at a furious pace, and you don’t want to run out. You’ll also want to get an external battery pack, as four hours of continuous Ingress play can drain your battery quickly. Most agents find a 3 A, 10,000 mAh battery pack to be plenty. You’ll probably be walking a lot, so pack light and make sure you wear some comfortable, broken-in shoes. Bring water and snacks, and come prepared for the weather. With hundreds of agents all playing in one location, scanner lag can sometimes rear its head. Be patient and keep trying if your scanner seems to be less responsive. Sometimes exiting the portal detail screen and going back into it can help. Portals are easier to defend than to take back, so in general, you’ll want to get to an important portal before the other faction so that you can capture it unopposed and be ready to defend it when the enemy arrives. The action can get pretty fast and furious during an anomaly, and at times you’ll chew up a lot of XM fast. It is at these moments that XM tanks can be most useful, so consider equipping one just before a measurement window. Be a good sport. Be gracious in victory or defeat, and friendly to all, whether frog or smurf. Below is a listing of past anomalies and their outcomes. Links to detailed information will be added over time.